Disclosure: This post is sponsored by Misook clothing. For women’s clothing, it’s very rare for a product to hit that the marks of having an original designer look yet be completely comfortable to wear throughout the day. Shoes are the product that often fail hardest at this, our favorite looking heals are often the ones that give us the worst blisters after just an hour or two. This is quite often true for the rest of our outfits, those things that fit well and are comfortable often look frumpy or have basic and drab designs; while the eye-catching outfits are stiff and not naturally fitting to our bodies. Misook Clothing is a brand that not only takes this head-on but redefines the standard by creating a look I haven’t seen anywhere else. From fit to colors I’ve never seen or worn anything quite like Misook, and the comfort of their clothes is unparalleled. The first thing that people probably think of when they hear Misook are their jackets. They have elegance and class, yet their mixtures of patterns and colors are like nothing else on the market. Even the solid color varieties have eye-catching differences that set it apart, from the buttons to the frayed edges, to the length and fit of a Misook jacket that gives a true silhouette look to them. One reason their pieces are so popular is that they dressy enough to wear on a nice dinner out with friends or coworkers, yet are still very unique and expressive. Here are some of my favorite Misook clothing pieces, many of them perfect for these winter months. Keep in mind that Misook clothing garments are machine washable, fade resistant and wrinkle-free. They also use breathable material that contributes to their garments being so comfortable. As I browsed the Misook website I realized how diverse their collections are, from chic blouses to pullovers, tunics and vests, tank tops that pop, and skirts and pants of every variety. Misook collections are very flexible so you can mix them up and create fresh outfit combinations. From the website I also discovered the Misook Collection area, with luxury items like cashmere, fine suede, and silk. On a final note, the Misook clothing brand has done an amazing job of making figure-flattering designs for sizes ranging from XS to 3X. Every woman deserves the chance to dress to kill and can do so with Misooks products. I really like the black jacket and all of the clothing you showcased here. I’m all about quality and comfort and this brand exceeds those standards. Beautiful clothing! I love that combo from the first picture! Those are my favorite colors and they looks great on me! I will add this to my Christmas list! WOW! I love these looks for the Holidays! I am all about comfortable clothes that will last so I am going to have to make sure I get some of these. It is wonderful to find pieces that are classic and can mix and match. Love the entire style and look of these clothes. I really love the first and last jacket! I would wear those to work and they really do look comfy. I love clothes that are not only of great quality, but comfortable to wear anywhere. I am all about knits these days. They are so comfy, cozy and soft. These look beautiful too. These clothes are so cool! They’re definitely doing something unique with these styles. Great choices for gift shopping! These are all such great clothes. Thank you for the code! I might have to do some shopping now. I love the simple styling and clean lines on this line of clothing. It also looks like they would travel very well too. Wow, these are such classic looks. I think that every woman needs a few of these pieces in her closet. What some awesome pieces of clothing I am absolutely in love with the fringe detail jacket that is totally right up my steet. I have not heard of this brand before. Great pieces of clothing especially 1 and 2 pieces. Those overjackets are adorable! I wear those a lot and they’re hard to find sometimes! What gorgeous and versatile pieces! I am all about the jackets. They are the perfect touch to those outfits. 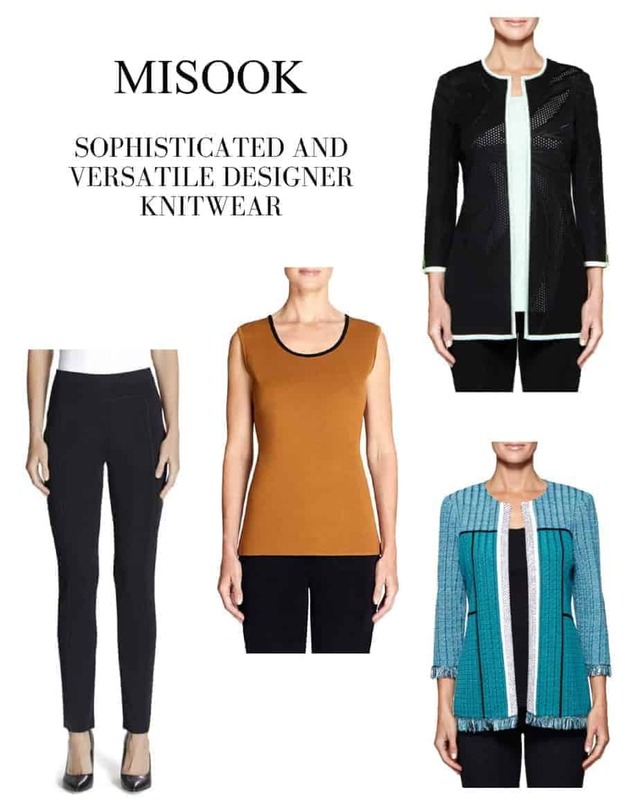 These Misook knitwear pieces look so elegant! I love the lapel jacket. Very business-like and professional looking. I am glad to know that they are machine washable too. I’ve never heard of this brand before but I really like what I see. That black jacket is my favourite. These aren’t really my style, but they look super classic and great for those who might wear them. I do like those black pants though.